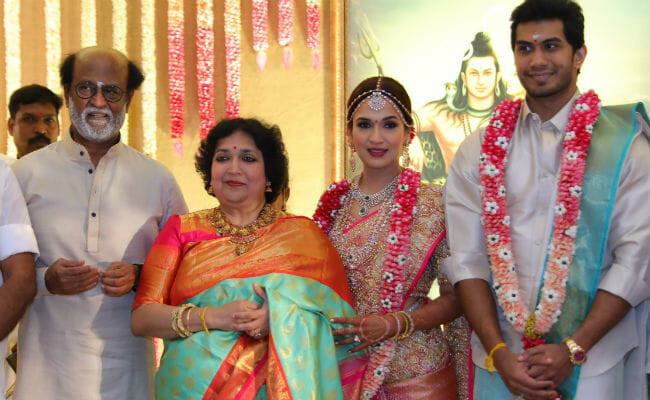 Filmmaker Soundarya Rajinikanth — daughter of superstar Rajinikanth — married actor Vishagan Vanangamudi in Chennai on Monday in a grand ceremony. From Tamil Nadu Chief Minister E Palaniswami to actor-filmmaker Kamal Haasan, there were a number of VIP guests at the wedding. Actors who attended included Mohan Babu, Vishnu Manchu, Prabhu, Vikram Prabhu, Aditi Rao Hydari, Andrea Jeremiah and Manjima Mohan. Filmmakers P Vasu, K.S. Ravikumar, Selvaraghavan and Kasthuri Raja were also there. On Sunday, a sangeet (pre-wedding) ceremony was organised, which was a close-knit family affair. Videos from the pre-wedding events, in which Rajinikanth can be seen dancing to some of his popular songs, have gone viral on social media. This is Soundarya’s second marriage. In 2010, she married industrialist Ashwin Ramkumar and they have a son, Ved. In 2016, Soundarya filed for divorce from Ramkumar and they subsequently separated. She made her directorial debut with ‘Kochadaiiyaan’, in which her father starred, and also founded Ocher Picture Productions. Vanangamudi made his acting debut last year with Tamil thriller ‘Vanjagar Ulagam’.